The window is a visual way of representing a person’s or group’s characteristic. through reducing the size of the other three areas. disclosure (sharing self safely) the size of this pane can shrink. person themselves. Through feedback people begin to know themselves more. undiscovered truths. Experiencing new situations will shrink this pane. 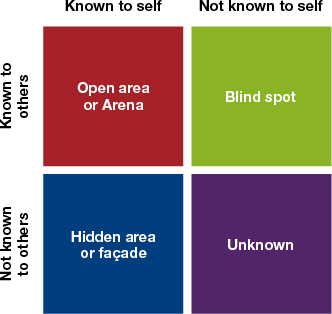 In this short video, MindsTools look at see how the Johari Window works, and how you can use it with your team to improve communication and trust.